1897 (November 8): Dorothy Day was born to Grace Satterlee and John Day in Brooklyn, New York. 1903: The Day family moved to California. 1906: The Day family moved to Chicago after the great San Francisco earthquake. 1914: Day graduated from high school at age sixteen, enrolled in University of Illinois (Urbana), joined the Socialist Club and Socialist Party, and distanced herself from Christianity. 1916: Day moved to New York where she remained for the rest of her life except for brief periods; she began writing for several socialist newspapers. 1917 (November 10): Day participated in suffrage demonstrations for which she was jailed in Washington, D.C. She and other prisoners embarked on a ten-day hunger strike. 1920–1921: Day was briefly married to Berkeley Tobey. 1924: Day published a novel, The Eleventh Virgin. 1925: Dorothy Day and Forster Batterham began to live together. 1926 (March 4): Tamar Theresa, daughter of Day and Batterham, was born. 1927: Tamar and, later that year, her mother were baptized in the Roman Catholic Church; Dorothy Day and Forster Batterham separated. 1932: Day met Peter Maurin. 1933 (May 1): The Catholic Worker newspaper was first distributed in Union Square, New York. 1936: The Catholic Worker organization established its headquarters in New York City and began Easton Farm, an agricultural commune in Pennsylvania. 1938: Day published From Union Square to Rome. 1939: Day published Houses of Hospitality. 1947: Easton Farm closed; the Catholic Worker organization purchased a new farm in Newburgh, New York. 1949 (May 15): Peter Maurin died. 1952: Day published The Long Loneliness: The Autobiography of Dorothy Day. 1955: Dorothy and others were arrested for refusing to participate in mandatory civil defense drills. 1963: Day joined fifty “Women for Peace” on a pilgrimage to Rome and returned two years later for the final session of the Second Vatican Council. 1963: Day published Loaves and Fishes. 1970: Mother Teresa recognized Day as an honorary member of the Missionaries of Charity. 1973: Day was imprisoned for protesting with United Farm Workers in California. This was her final imprisonment. 1977: Pope Paul VI sent greetings on Day’s eightieth birthday. 1980 (November 29): Dorothy Day died at Maryhouse, the Catholic Worker house for women in New York City. 2000: The Vatican accepted the request of John J. O’Connor, archbishop of New York, to open the case for Dorothy Day’s canonization. By her own account, Dorothy Day came to recognize that she had always been “haunted by God,” but it took thirty years for her to acknowledge that and to respond fully (Day  1981:11). Born into a nominally Christian family, she was drawn to a writing career by her journalist father, John Day. Even as a child she developed a deep concern for and a passion to serve the poor especially after witnessing the suffering caused by the 1906 San Francisco earthquake. This attracted her to socialism and led her to reject Christianity for its failure to confront injustice during her brief time at the University of Illinois (Urbana). After relocating to New York City, Day moved in artistic and politically radical circles. She routinely engaged in protests and wrote about them for socialist publications. She also wrote a semi-autobiographical novel, The Eleventh Virgin (1924), in addition to having several affairs and a brief unsuccessful marriage. She finally entered into a committed relationship with Forster Batterham, a self-styled anarchist. Her life with Forster and especially the birth of their daughter Tamar Therese in 1926 brought Dorothy greater joy than she had ever known. [Image at right] That joy drew her to God, and led her to conclude that she had been seeking God all along, and that God had been seeking her. Wanting her daughter to have belief in that God from the very beginning, Day decided to have her baptized in the Roman Catholic Church despite Forster’s strenuous objection to all religious practice. Dorothy herself was baptized some months later, after brief instruction, which consisted in her memorizing and reciting answers to questions from the catechism of the Roman Catholic Church. From that point, she and Forster separated permanently, though they remained in touch for the rest of his life. Dorothy was able to accept baptism into the Catholic Church in part because she came to see it as the church of the poor, that is, of those who filled the pews rather than its leaders or structures. For the next few years she struggled to discover how to incorporate her new Catholic identity with working for justice for the poor. She continued to work as a journalist for radical publications until Peter Maurin (1877–1949) showed up on the doorstep of her apartment in New York City. A laborer and autodidact deeply schooled in Catholic Social Teaching and much influenced by French personalists, Maurin had emigrated from France to Canada, and from there to the United States. He wanted Dorothy to start a newspaper to publicize his analysis of the evils of capitalism and proposals for a society where it was “easier to be good.” Seeing that the paper would offer an alternative to Communist publications on similar subjects, Day named it The Catholic Worker (rather than Peter’s preferred Catholic Radical) and first distributed it in 1933 during Communist May Day celebrations for a penny a copy. To Peter’s dismay the paper did not limit itself to his “Easy Essays,” but included reporting on current social issues and commentary by Day and others. Maurin’s program for the renewal of society involved regular roundtable discussions for the clarification of thought, houses of hospitality for those in poverty, and farming communes. Day made all this happen. The roundtable discussions began immediately, and soon afterward Day rented an apartment which served as the original house of hospitality to address the desperate need of many in Depression-era New York. This was quickly succeeded by additional rented apartments and houses, and soon afterwards, by the purchase of a farm in Pennsylvania. At the farm and in the other houses, those in material need were joined by others who chose to live voluntary poverty, accepting alms but no government support or salaries for their labor. Soon groups in other cities began to form Catholic Worker houses. By the beginning of 2017, there were 216 Catholic Worker communities in the United States, and an additional thirty-two worldwide. When she became unable to travel, Dorothy Day continued to write in support of a wide variety of causes, even up to the time of her death in 1980 at Maryhouse, the Catholic Worker house for women in New York City. The core of the doctrines Dorothy Day espoused and enacted is starkly simple and traditionally Catholic, but her interpretation of those doctrines proved to be quite revolutionary. According to Matthew 25, what is done for the least of God’s people is done for God. Day’s natural concern for those who suffer, as indicated in her writings about her childhood, was thus given a religious imperative. This commandment (to feed the hungry, clothe the naked, shelter the homeless) she followed faithfully herself, and she made it the cornerstone of the Catholic Worker from its inception in serving casualties of the Depression on its breadlines. Paul’s first letter to the Corinthians goes even further than Matthew 25 in identifying God with God’s people when he describes the community as the Body of Christ; this is what Catholic tradition has called the Mystical Body. Day believed deeply in this spiritual union and was convinced that it also had practical consequences; thus, she considered labor unions one expression of the Mystical Body of Christ. However, she insisted that those who exercise the “works of mercy” without a clear vision “become merely philanthropists, doling out palliatives.” For Day, the Catholic Worker’s underlying, animating vision consists of “working for ‘a new heaven and a new earth, wherein justice dwelleth.’ We are trying to say with action, ‘Thy will be done on earth as it is in heaven.’ We are working for a Christian social order” (The Catholic Worker February 1940:7, emphasis hers). that it looks like new (Maurin 1979:183). the realization of the dignity of the other fellow, of our obligations to him, the willingness to work with him on those elements of the Truth he has seized hold of, accepting his cooperation as far as he will give it, and the refusal to admit disappointment when he doesn’t go as far as we think he might (The Catholic Worker December 1947:1). Belief in the essential dignity of the human person grounds the obligation of everyone to care for those in need, rather than transferring that responsibility to the impersonal state; hence the Catholic Worker refuses all forms of government support and relies on donations and the labor of those in the houses. That same belief requires acknowledging the freedom of all persons to live out their understanding of the truth, a critical but challenging element of community in the Catholic Worker tradition. Day followed this tradition in welcoming back into the community one member of a Worker house who had left to serve in the armed forces during the Second World War. Love of brother means voluntary poverty, stripping one’s self, putting off the old man, denying one’s self, etc. It also means nonparticipation in those comforts and luxuries which have been manufactured by the exploitation of others. While our brothers suffer, we must compassionate [sic] them, suffer with them. While our brothers suffer from lack of necessities, we will refuse to enjoy comforts (The Catholic Worker December 1944:1). Instead of gearing ourselves in this country for a gigantic production of death-dealing bombers and men trained to kill, we should be producing food, medical supplies, ambulances, doctors and nurses for the works of mercy, to heal and rebuild a shattered world (The Catholic Worker June 1940:4). [W]hen [I] lie in jail thinking of these things, thinking of war and peace, and the problems of human freedom . . . and the apathy of great masses of people who believe that nothing can be done, I am all the more confirmed in my faith in the little way of St. Thérèse. We do the minute things that come to hand, we pray our prayers, and beg also for an increase in faith—and God will do the rest (The Catholic Worker September 1957:6). Although she always insisted that her mentor Peter Maurin was the founder of the Catholic Worker, it may be more accurate to say that Dorothy Day founded the movement based on Maurin’s inspiration. She certainly implemented his theoretical imperatives. She remained at the helm of The Catholic Worker for decades and continued to write for the “On Pilgrimage” column until the year before her death. [Image at right] In the Catholic Worker communities in which she lived, and even in those she merely visited, her presence clearly influenced the way the movement developed. She insisted on the Catholic Worker’s spiritual grounding and its rejection of all forms of violence, holding firm when widespread public admiration evaporated in the face of the group’s refusal to support the entrance of the United States into World War II and their subsequent resistance to civil defense drills. Yet her primary form of leadership was her life, her painful efforts to remain faithful to the commands of the gospel by deliberately choosing hardship rather than comfort. In the end, perhaps the title “founder” should not be given to either Day or Maurin, since the Catholic Worker is not a tightly knit organization but a loose association of individuals and groups who share the desire for a world where, in the words of Peter Maurin, “it is easier to be good” and a willingness to work for the creation of such a world. One challenge faced by the Catholic Worker was its relationship to the Roman Catholic Church. For Dorothy Day, that relationship was at the core of her identity. She insisted that if the cardinal archbishop of New York ordered her to disband the Catholic Worker, she would comply, and then establish a new organization. But when a priest in the diocese demanded that she remove the word “Catholic” from the newspaper’s masthead, she respectfully declined. Nor was she willing to withdraw her support from a group of gravediggers who sued the archdiocese over working conditions in 1949. Another challenge to the Catholic identity of the movement is the fact that many who were part of the movement have not shared Day’s attachment to the Catholic Church. A number of the Catholic Worker houses in existence in 2017, in spite of their name, declare themselves to be interfaith rather than Catholic. Yet none of this was the greatest challenge Dorothy Day faced. Her diaries, published posthumously, make it clear that she found living the Gospel commandment to love in the concrete, day after day, the most demanding. Always a realist, she rejected an understanding of love as consisting simply of warm feelings. As she said, quoting Dostoyevsky, “Love in action is a harsh and dreadful thing compared to love in dreams” (The Catholic Worker, January 1967:2). Yet she continued to dedicate herself to “love in action,” and as a result the Roman Catholic Church has begun the process that will likely lead to her canonization as a saint. 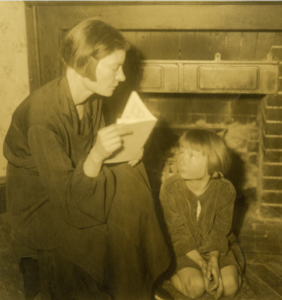 Image #1: Dorothy Day reading to her daughter Tamar, circa 1932. Courtesy of the Department of Special Collections and University Archives, Marquette University Libraries. Image #2: Photograph by Bob Fitch. 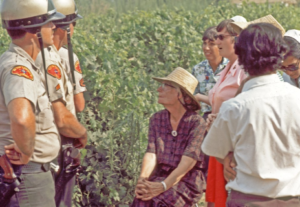 Dorothy Day on UFW picket line faces sheriff. Lamont, California, August 1973. Courtesy of the Department of Special Collections, Stanford University Libraries. https://searchworks.stanford.edu/view/ng668fq9392k. Image #3: Photograph by Bob Fitch. Catholic Worker, New York City 1973. 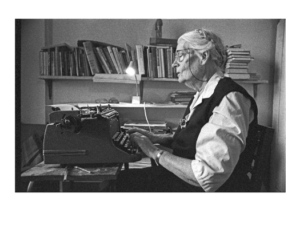 Journalist Dorothy Day at typewriter. Courtesy of the Department of Special Collections, Stanford University Libraries. https://searchworks.stanford.edu/view/sq465yj8784. The Catholic Worker. May, 1933 – present. The Catholic Worker Movement website. Accessed from http://www.catholicworker.org on 19 January 2017. Coles, Robert. 1989. Dorothy Day: A Radical Devotion. Radcliffe Biography Series. Boston: Da Capo. Day, Dorothy. 2010. All the Way to Heaven: The Selected Letters of Dorothy Day. Edited by Robert Ellsberg. Milwaukee, WI: Marquette University Press. Day, Dorothy. 2008. The Duty of Delight: The Diaries of Dorothy Day. Edited by Robert Ellsberg. Milwaukee, WI: Marquette University Press. Day, Dorothy. 2006 . From Union Square to Rome. Maryknoll, NY: Orbis. Day, Dorothy. 2005. Selected Writings: By Little and by Little. Edited by Robert Ellsberg. Maryknoll, NY: Orbis. Day, Dorothy. 1999 . On Pilgrimage. Grand Rapids, MI: Eerdmans. Day, Dorothy. 1981 .The Long Loneliness: The Autobiography of Dorothy Day. San Francisco: Harper & Row. Day, Dorothy and Francis J. Sicius. 2004. Peter Maurin: Apostle to the World. Maryknoll, NY: Orbis. Forest, Jim. 2011. All Is Grace: A Biography of Dorothy Day. Maryknoll, NY: Orbis. Holben, L. R.  2010. All the Way to Heaven: A Theological Reflection on Dorothy Day, Peter Maurin and the Catholic Worker. Eugene, OR: Wipf & Stock. Klejment, Anne. 2009. “The Spirituality of Dorothy Day’s Pacifism.” U.S. Catholic Historian 27:1–24. Klejment, Anne. 1986. Dorothy Day and the Catholic Worker: A Bibliography and Index. New York: Garland. Klejment, Anne and Nancy L. Roberts, eds. 1996. American Catholic Pacifism: The Influence of Dorothy Day and the Catholic Worker Movement. Westport, CT: Praeger. Maurin, Peter. 1979. Easy Essays. Edited by Dorothy Day et al. Chicago, IL: Franciscan Herald Press. Merriman, Brigid O’Shea. 1994. Searching for Christ: The Spirituality of Dorothy Day. Notre Dame: University of Notre Dame. Miller, William D. 2005. A Harsh and Dreadful Love: Dorothy Day and the Catholic Worker Movement. Milwaukee, WI: Marquette University Press. O’Connor, June. 1991. The Moral Vision of Dorothy Day: A Feminist Perspective. New York: Crossroad. Richey, Lance Byron. 2015. “Stages Along Life’s Way: House of Hospitality and the Development of Dorothy Day’s Spirituality.” American Catholic Studies 126:25–41. Thorn, William J., Phillip Runkel, Susan Mountin, eds. 2001. Dorothy Day and the Catholic Worker Movement: Centenary Essays. Milwaukee, WI: Marquette University Press.